Beautifully engraved and hard to find Stock Certificate from the Barnum & Bailey Limited issued in 1902, England. This historic document was has an ornate border around it with a vignettes of P.T. Barnum and James A. Bailey. This item is hand signed by the company's officers and is over 104 years old. The certificate was issued to The Commercial Bank of Scotland - Edinburgh for 93 shares. The certificate has three liquidators stamps (Feb 1908, April 1908 and April 1909) giving details of dividends paid on the shares. Most of the shares were turned in when the company was sold to the Ringling Bros in 1907. Ringling Bros. and Barnum & Bailey� -- THE GREATEST SHOW ON EARTH�! As much a part of American culture as baseball, hot dogs, and apple pie! Some say it began on April 3, 1793, when John Bill Ricketts gave the first circus performance in Philadelphia. Some say it began on July 5, 1810, when P.T. Barnum was born in Bethel, Connecticut. Still others say it began on March 29, 1919, when the first performance of Ringling Bros. and Barnum & Bailey� was held in New York City's Madison Square Garden. But for everyone at THE GREATEST SHOW ON EARTH�, the real beginning is that moment when the lights go down and the show is just about to start. Anticipation! Expectation! And before long, everyone in the audience has begun his or her own personal history with one of the most unique entertainment forms mankind has known: the circus. But not just any circus: Ringling Bros. and Barnum & Bailey�! THE GREATEST SHOW ON EARTH� is one of a kind, and experiencing the show has been a family tradition for 130 years! There is no proof that Phineas Taylor Barnum ever said "there's a sucker born every minute." He did, however, say that "every crowd has a silver lining," and acknowledged that "the public is wiser than many imagine." In his 80 years, Barnum gave the wise public of the 19th century shameless hucksterism, peerless spectacle, and everything in between -- enough entertainment to earn the title "master showman" a dozen times over. In choosing Barnum as one of the 100 most important people of the millenium, Life magazine recently dubbed him "the patron saint of promoters." Barnum was born on July 5, 1810, in Bethel, Connecticut. The oldest of five children, he showed his flair for salesmanship at an early age, selling lottery tickets when he was just 12 years old. When he was 25, Barnum paid $1,000 to obtain Joice Heth, a woman who claimed to be 161 years old and the nurse of George Washington. "Unquestionably the most astonishing and interesting curiosity in the world!" read one of Barnum's handbills. Barnum exhibited her in New York and New England, raking in about $1,500 per week. In 1841, Barnum purchased Scudder's American Museum on Broadway in New York City. He exhibited "500,000 natural and artificial curiosities from every corner of the globe," and kept traffic moving through the museum with a sign that read, "This way to the egress" -- "egress" was another word for exit, and Barnum's patrons would have to pay another quarter to reenter the Museum! A year later, he exhibited "The Feejee Mermaid," ostensibly an embalmed mermaid purchased near Calcutta by a Boston seaman. Belief in the mermaid's authenticity was mixed, but nobody doubted Barnum's ability to capture the imagination of the public. Later in 1842, Barnum hired Charles Stratton, who became world-famous as General Tom Thumb. The two became close friends, and so successsful that, in 1844, they had an audience in England with Queen Victoria. While Barnum's name will forever be connected with the great American circus, it is often said that his greatest success came in 1850, when he presented European opera star Jenny Lind to the American public. "The Swedish Nightingale" sang 95 concerts for Barnum. In 1854, Barnum wrote and published his autobiography: The Life Of P.T. Barnum, Written By Himself. Sixteen years later, his association with the entertainment form that still bears his name would begin. Barnum was 60 years old when P.T. Barnum's Grand Traveling Museum, Menagerie, Caravan, and Circus made its debut. At the time, it was the largest circus venture in American history. "We ought to have a big show," Barnum said. "The public expects it, and will appreciate it." Appreciate it they did: Barnum grossed $400,000 in his first year of operation. By 1872, Barnum was already referring to his enterprise as "THE GREATEST SHOW ON EARTH�" -- and it was! "P.T. Barnum's Traveling World's Fair, Great Roman Hippodrome and Greatest Show On Earth�" covered five acres and accommodated 10,000 seated patrons at a time ... and, to reach more people, took to the rails. 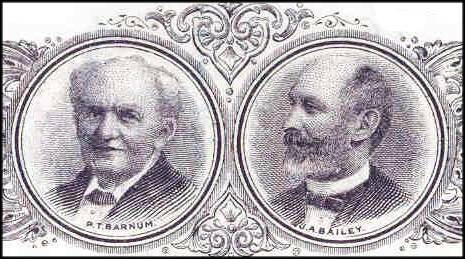 In 1881, Barnum joined promotional forces with James A. Bailey and James L. Hutchinson. The result was "P.T. Barnum's Greatest Show On Earth, And The Great London Circus, Sanger's Royal British Menagerie and The Grand International Allied Shows United." It soon became known as the "Barnum & London Circus." One of Barnum's biggest successes -- literally! -- came in 1882 with his acquisition of Jumbo. Dubbed "The Towering Monarch of His Mighty Race, Whose Like the World Will Never See Again," Jumbo arrived in New York on April 9, 1882, and attracted enormous crowds on his way to his name becoming a part of the language. In 1883, one of Barnum's greatest promotional coups was staged as Barnum walked Jumbo across the Brooklyn Bridge to test the strength of the new engineering marvel! Barnum and Bailey went their separate ways in 1885, but rekindled their business relationship once again in 1888. That year, the "Barnum & Bailey Greatest Show On Earth�" first toured America. Several weeks before he died in his sleep, on April 7, 1891, Barnum read his own obituary: The New York Sun newspaper, responding to Barnum's comment that the press says nice things about people after they die, ran his obituary on the front page with the headline, "Great And Only Barnum -- He Wanted To Read His Obituary -- Here It Is." Appropriately, it is reported that Barnum's last words were about the show, which was appearing in New York's Madison Square Garden at the time: "Ask Bailey what the box office was at the Garden last night." Following a funeral service that Barnum himself had planned and the singing of "Auld Lang Syne," the great showman was laid to rest at Mountain Grove Cemetery in Bridgeport, Connecticut. Following the death of P.T. Barnum in 1891, James A. Bailey carried the Barnum & Bailey Circus to new heights of popularity. THE GREATEST SHOW ON EARTH� rode the rails on 85 railroad cars, employed more than 1,000 people, and consisted of five rings and stages, plus the largest traveling menagerie anywhere! Meanwhile, as the 19th century was coming to a close, the Ringling brothers of Baraboo, Wisconsin, were building a reputation of their own. Beginning their tented circus in 1884, Alf T. Ringling, Al Ringling, Charles Ringling, John Ringling, and Otto Ringling soon became known as Kings Of The Circus World. A sixth brother, Henry Ringling, joined the show in 1886. By 1887, the Ringling brothers' show was growing. The official title was Ringling Bros. United Monster Shows, Great Double Circus, Royal European Menagerie, Museum, Caravan, and Congress of Trained Animals. In 1889 the seventh Ringling brother, A.G. "Gus" Ringling, joined the show, which now had a seating capacity of about 4,000 as it played cities and towns in Wisconsin and Illinois. Admission was 50 cents for adults and 25 cents for children. The year also marked a first for the Ringlings, as they took to the rails, becoming the 12th such circus to do so. As time went on, the Ringlings' show grew bigger, and a series of business deals enabled them to absorb some of their competition. In 1905, James A. Bailey sold the Ringlings 50 percent interest in his Forepaugh-Sells Bros. Circus; Bailey died in the spring of 1906, and the Ringlings subsequently purchased the other 50 percent from his widow for $100,000. In 1907, the Ringlings finally purchased their largest competitor -- Barnum & Bailey Circus -- after more than a year of discussion and negotiation. Interestingly, the Ringlings were split in their opinions as to whether the purchase ought to have happened: Otto and John wanted the deal to happen, while Al, Charles, and Alf T. needed to be convinced. On July 8, 1907, the deal went through and THE GREATEST SHOW ON EARTH� became the property of the Ringlings for a price of $400,000. The Ringlings shared the public's respect for the Barnum & Bailey name, and toured the two shows separately until 1919. That year, due to wartime conditions that included labor shortages and rail travel problems, the Ringlings merged the two great entities. The result, consisting of 100 double-length railroad cars and 1,200 employees, was arguably the largest traveling amusement enterprise up to that time: Ringling Bros. and Barnum & Bailey� Combined Shows, THE GREATEST SHOW ON EARTH�. THE GREATEST SHOW ON EARTH� was becoming truly legendary, but none of John Ringling's six brothers lived to see what was perhaps his greatest business triumph. In 1929, reacting to the fact that his competitor, the American Circus Corporation, had signed a contract to perform in New York's Madison Square Garden, Ringling purchased American Circus for $1.7-million. In one fell swoop, Ringling had absorbed five major shows: Sells-Floto, Al G. Barnes, Sparks, Hagenbeck-Wallace, and John Robinson. By the time John Ringling died in 1936, Ringling Bros. and Barnum & Bailey� Circus had become deeply ingrained into the American tradition and consciousness. John Ringling North, an executor of his uncle's estate, became president of the show in 1937, a position he held until 1943 when his cousin, Robert, became president. John took the position once again in 1947. Times, and the public's taste, were changing, and the circus had problems keeping pace. On July 16, 1956, in Pittsburgh, Pennsylvania, the financially troubled Ringling Bros. and Barnum & Bailey� gave its last performance under the big top. John Ringling North commented that "the tented circus as it exists today is, in my opinion, a thing of the past." Life magazine wrote that "a magical era had passed forever." Before long, though, the magic would return. Later that year, Irvin Feld would save Ringling Bros. and Barnum & Bailey� from oblivion by masterminding its transition from tents to arenas, his vision and creativity ushering in a new era of entertainment. Feld not only restored Ringling Bros. and Barnum & Bailey� to its former glory, but set the stage for THE GREATEST SHOW ON EARTH to reach new heights of excellence! Following the July 16, 1956, performance of Ringling Bros. and Barnum & Bailey� in Pittsburgh, Pennsylvania, THE GREATEST SHOW ON EARTH� under the direction of John Ringling North ceased operation. Media around the world mourned, but one man believed in The Greatest Show On Earth� and was clever enough to know exactly how to preserve this beloved institution. Irvin Feld and his brother, Israel, had made their mark as pioneers in the burgeoning rock 'n' roll concert tour business. They were familiar with the new arenas that were springing up like mushrooms in cities all across America. Feld suggested THE GREATEST SHOW ON EARTH� become an exclusively indoor presentation. On April 3, 1957, the new tour was put into effect with Feld in charge of booking and promotion. Irvin Feld had always wanted to own Ringling Bros. and Barnum & Bailey� and thus have control over all aspects of the show, including production. On November 11, 1967, his dream became reality as the Feld family purchased Ringling Bros. and Barnum & Bailey� from John Ringling North. As befits THE GREATEST SHOW ON EARTH�, the contract was signed during a ceremony at the Colosseum in Rome, Italy! Irvin Feld effected change quickly, and ushered in the modern-day era of circus in America. Within two years, he created a second unit of Ringling Bros. equal in size, scope, and quality to the first. Through an unprecedented circus purchase of $2-million, Feld secured the talents of German animal trainer Gunther Gebel-Willams, who quickly became a living circus legend known worldwide. In 1968, Feld also created Ringling Bros. and Barnum & Bailey� Clown College to preserve the ancient and honorable art of clowning. Ever the astute promoter, Irvin Feld designed a new two-year tour system for Ringling Bros. and Barnum & Bailey�. He also utilized with great effect national advertising campaigns, national television specials, and creative public relations, thus bringing the once-declining Ringling Bros. back to its rightful place as a premier American art form, and inclining Time magazine to refer to him as "The Greatest Showman On Earth." In 1970, Feld's only son, Kenneth, joined Ringling Bros. and learned the craft of production from the master, his father. Confident in his son's abilities, Irvin Feld made Kenneth Feld a co-producer in 1973. After a brief ownership by Mattel, the Feld family reacquired Ringling Bros. and Barnum & Bailey� on March 17, 1982. When Irvin Feld suddenly died on September 6, 1984, Kenneth Feld immediately stepped in to assume control and sustain, if not surpass, the level of entertainment excellence set forth by his father and other legendary showmen before him. In 1810, the Commercial Banking Company of Scotland was founded in Edinburgh as a copartnership to provide banking facilities to commercial, industrial and agricultural businessmen of modest means - it was to be 'the bank of the citizens'. As a joint stock bank with substantial capitalisation and shareholding it presented a considerable challenge to the existing public banks which had tended to do business only with individuals or companies of substance. From the outset it issued its own notes and began to establish branches over a wide geographical area. By 1815 it had fourteen branches and had moved from the then suburban environs of Leith Walk into a head office in High Street, close to Edinburgh's commercial centre. Commercial Banking Company grew rapidly acquiring the Caithness Banking Company (established 1812) of Wick in 1825. It finally secured a Royal Charter in December 1831 and changed its name to Commercial Bank of Scotland. By 1840 the bank boasted forty-five branches and, in 1844, took over the Arbroath Banking Company (established 1825), operating in Arbroath and Forfar. In 1843 the bank acquired property in George Street where, four years later, it opened a magnificent, purpose-built head office designed by architect David Rhind in the style of a Greek temple decorated with pillars and pediment. By 1850 it had fifty-three branches, the second largest network of any Scottish bank. Despite its substantial presence in Glasgow, the bank was virtually unaffected by the failure of Western Bank in 1857 but in 1879, following the disastrous collapse of the City of Glasgow Bank, Commercial Bank registered under the Companies Act trading with limited liability from 1882. In 1883, following the example of other Scottish banks, Commercial Bank opened an office in London and by 1900 had 138 branch banks. During the First World War one sixth of Commercial Bank's staff were killed on active service, but the businesses continued to thrive increasing the number of its branches to 240 in 1920. During the inter-war period it became the second largest bank in Scotland in terms of liabilities, deposits and advances. Despite its success and large number of branches, Commercial Bank's capital resources were modest, its interests undiversified and its management aware of the acute need to find a suitable trading partner. In 1951-2 desultory talks were held with the Bank of Scotland and Union Bank and later with Barclays Bank and British Linen Bank. However, in 1953, a new general manager, Ian Wilson Macdonald, determined to broaden the bank's interests. He recognised that hire purchase companies were profiting from funds borrowed from bankers and in 1954 negotiated the purchase of Scottish Midland Guarantee Trust, the hire purchase subsidiary of Scottish Motor Traction. Commercial Bank of Scotland thereby became the first British bank to take a direct financial interest in a hire purchase firm and the other banks were quick to follow. Later, in 1959, a merger agreement was reached with National Bank of Scotland (established 1825) to form National Commercial Bank of Scotland.